Using our easy to follow guide find out how to identify different types of light switches such as the 1 gang switch, 2 gang switch, the intermediate switch, plate switches and ceiling switches. What is a 1 or a 2 gang light switch? ‘Gang’ describes the number of switches on the plate. They are sometimes called rockers, throws or dimmers, depending on how they operate, but still they just refer to the number of light switches on the plate. It is possible to get more, but it is very uncommon to have more that three in a domestic setting – this would be called a 3 gang switch. If you have a dimmer switch they are described in the same way; a 1 gang dimmer switch will have a single dimmer on the plate, and a 2 gang dimmer switch will have 2 dimmers and so on. A 1 gang switch will control a single lighting circuit, and with a 2 gang switch you can control two lighting circuits, and so on. However if you need two switches to control a single lighting circuit, such as in the case of at the head and foot of stairs so you can switch the lights on and off in both places, you need to understand a 2 ‘way’ switch. 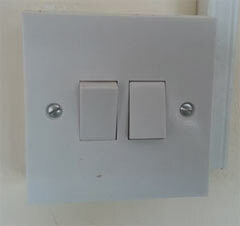 It is also possible to install or fit a variation on the theme by combining dimmer and "throw" switches on the same plate. You are then able to set the light to the required ambiance and turn it on and off. 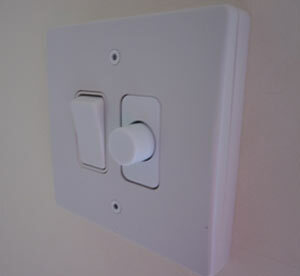 The ambiance setting is remembered by the switch but can be altered just like any other dimmer. What does 1 way, 2 way and intermediate light switching mean? 1 Way Switches: If a light switch is ‘1 way’ this means it is just an on/off switch. This is the simplest type of switch that you can get. The single switch controls a single light (or lighting circuit). 2 Way Switches: A ‘2 way’ switch means there is another switch controlling the same light. These are often used on a stair case, large room with switches by each door. Intermediate Switches: If you need to control the lights from three places, say you have 3 entrances to a large room and need a light switch next to each one, you will need an intermediate switch. The light(s) can be switched on and off from anyone of 3 places. On the whole 2 or 3 gang switches will always be 2 way switches. If you are buying switches and don’t know exactly what you need then it is often a good idea to get a 2 way switch anyway. This is because if you only need a 1 way switch you can still use it by only connecting one of the terminals (L1 or L2) and common terminal. (If the switch doesn’t work the way you want it to, you can either turn the switch around or swap the L1 and L2 terminal). In this project we have been talking about plate switches which are the most common types of light switch that are used in peoples homes. 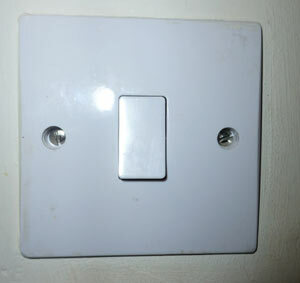 A Plate Switch refers to a switch that has the switching mechanism (either a rocker or dimmer) mounted on a face plate. 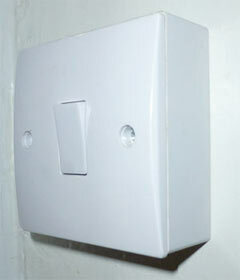 These switches can be flush mounted into a metal box which is sunken into the plaster of the wall. Plastic boxes are placed into plasterboard, or stud, walls. In either case these boxes are called patress boxes. You can see more information about how to do this and how to cut chases here. 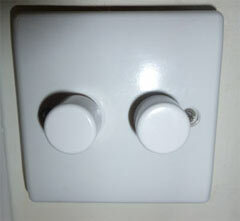 Some plate switches are mounted in plastic boxes on the surface of the wall. This might be because it is impossible to set the switch back or you don’t want to for styling reasons. In some cases there is not enough to have the traditional square or rectangular plate fitted and the switches need to be mounted above each other, rather than side by site. These are known as architrave switches. 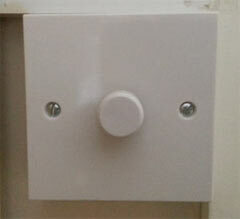 These can have rockers or dimmer switches, depending on what you prefer. 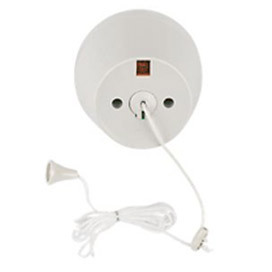 It is forbidden to wire a conventional switch within reach of a washbasin, bath or shower unit so you will need to use a ceiling switch in these circumstances, or put the plate switch outside the bathroom. A ceiling switch is mounted to the roof and is switched on and off using a pull cord – see our project on how to fit a pull cord switch. It is very important to be safe. Please have a look at our project on electrical safety before you begin any project. Don’t take any chances; if you don’t understand the job from start to finish then don’t attempt it. Make sure that the power is off and the circuit that you are working has been isolated. If you have any doubts at any time then you should consult a professional. Also remember that there are a large number of jobs that you are simply not allowed to do yourself if you are not properly trained. And if you are modifying any circuits then these must comply with the latest IEE Wiring Regulations. Please see our project on Part P of the building regulations to understand the extent of electrical work you are not allowed to do in the home.